Buena Vista began as a tourist camp for travelers, part of a 5,392-acre property purchased by R.E. Ashley in 1926. 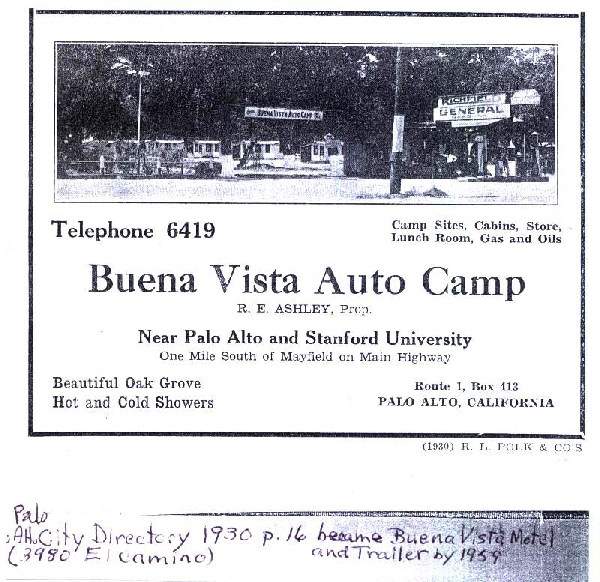 A historical photograph of the Buena Vista Auto Camp shows a row of tiny wooden cabins built on raised platforms with narrow spaces built between them, ostensibly for parking, according to Doug Graham a Barron Park neighborhood historian. The site had a store, lunch room, gas station and hot and cold showers.The lunch room, probably the Buena Vista Cafe, was located approximately where Blockbuster Video is today. The cafe was the first business to open along El Camino between Palo Alto and Mountain View. It was a place where one could pull off a highway and buy a sandwich. Buena Vista, Spanish for “beautiful view,” could have gotten its name from the grove of large and ancient oaks that populated the site. Period photographs show clusters of automobiles gathered under the huge trees. In 1932, Fran Weiler purchased the property, including the cafe, gas station and trailer park. The cafe was renamed the “Chat & Chew” in the late 1930s. According to an oral history by Joe Weiler, Fran’s son, it served 16 varieties of doughnuts for 35 cents a dozen, Graham said. In the late 1940s, the trailer park began to look more like it does today, with some trailers appearing to be fixed in place, according to Graham. The park settled down into a permanent trailer camp in the 1950s. By 1966, most of the trailers were no longer mobile and were occupied by long-term owners or renters. Chat & Chew moved across the street and the All-American Market, a full-service market, moved into a new building. The Weiler family sold the property to Joe Jisser in 1986. All-American Market closed after Jisser cancelled its lease in 1998. The building was renovated and reopened as a mall. Today it houses a Blockbuster, Baja Fresh, Jamba Juice and Right Start infant boutique. 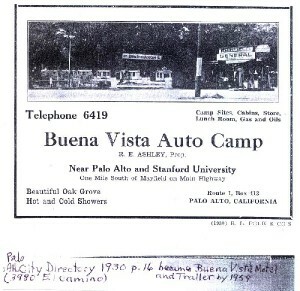 According to city records, in 2000, Buena Vista residents appealed to the City of Palo Alto to protect them from rapidly rising rents after the Jissers needed to recoup losses from a dissolved partnership. The city enacted a temporary moratorium limiting increases to 5 percent until an ordinance was worked out regarding mobile-home-park conversion. The ordinance includes provisions for tenants’ redress to the city regarding rent increases they feel to be excessive. Twenty-five percent of tenants must sign a petition and the city will conduct a hearing to determine if the rent increase is just.